Parkway Nissan | Blog | CH-CHing! Sentra Giveaway! Its not every day you get to give away a car, but on June 24 we got to give away our 3rd car through CHCH and the CH-CHing! contests. First we gave away a Micra, then a gorgeous Rogue – this time it was a 2015 Nissan SR Premium! Grant Thompson drove out to Grimsby with Jason Portuondo to present the winner of the CH-CHing! Search For the Sentra contest with his Sentra. Murray Witlox was speechless and cried tears of joy as he was presented with his new car. Grant helped out when Murray was unable to find the words to tell his wife, Jennifer, they had won. 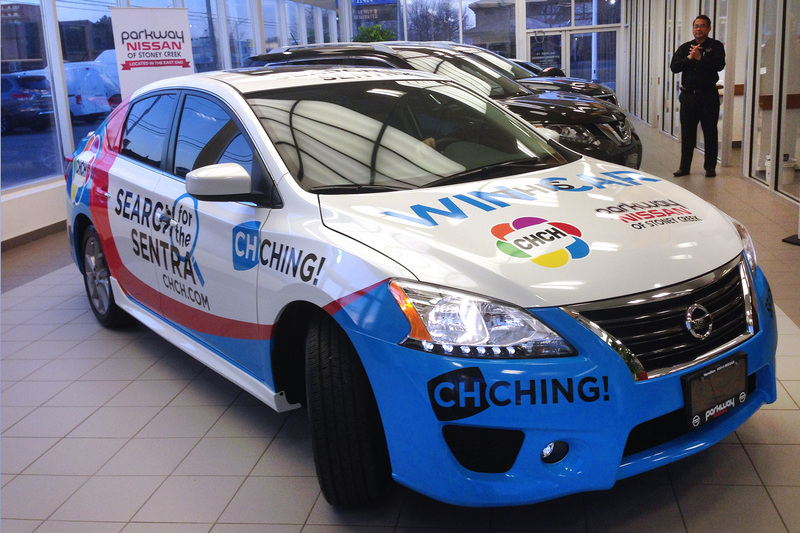 Parkway Nissan is lucky to be partnered with CHCH for this fun give away. The emotion and excitement of giveaway day is such a fantastic experience. Congratulations again Murray Witlox!